The datum of Digital Elevation Model of Venus, included in the archive, derived from raster data of Global Topography Data Record of Magellan mission, which distributed by Planetary Data System (PDS) of NASA. Base resolution of the datum is 45/1024°. The datum presented here generally in form of .ZRS-files (stands Zipped Raster Set), which is proprietary compressed format of author of the datum. Separated files of the datum are in hierarchical and multi-resolution relation for optimization of speed and appearance upon using in Spatial Aspect Viewer and Spatial Aspect Explorer. The datum was prepared by re-projecting original data in sinusoidal projection to cylindrical projection, using linear interpolation along longitude direction. 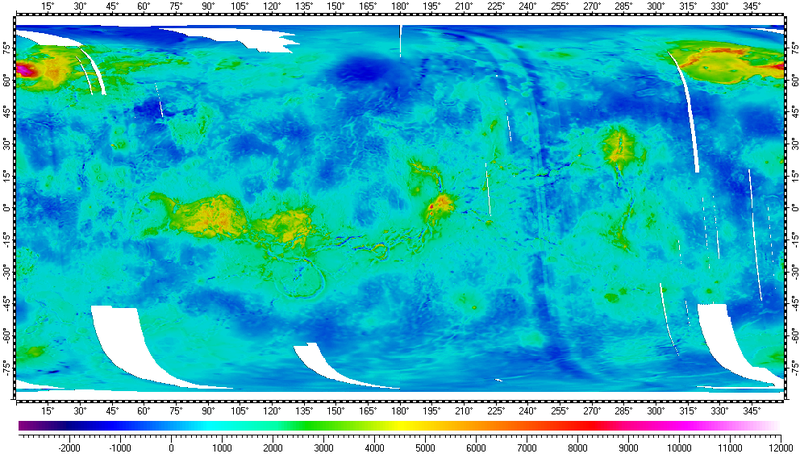 Also the datum contents set of spatial regions covered quadrangles of Venus. VenusLongLat.zip - Size: 45,459,697 bytes (43.3 MB); MD5: 93D2097573F79FCD65450E79C56812D4.